I have seen ST Math change lives first hand. It is a program that has truly had a positive impact on both students and staff. When I first discovered ST Math, I had just been named principal at Martin Elementary, and the school had been identified as one of the 10 lowest performing schools in Santa Ana. Our school population was over 98% Hispanic, over 97% free- and reduced-lunch and over 89% English language learners. We had heard about the positive impact the ST Math program had on nearby Madison Elementary School, a school very similar in population (and where I am principal today). We came together as a staff to identify best practices at other schools. The very first best practice that the staff identified was ST Math, a computer-based program. 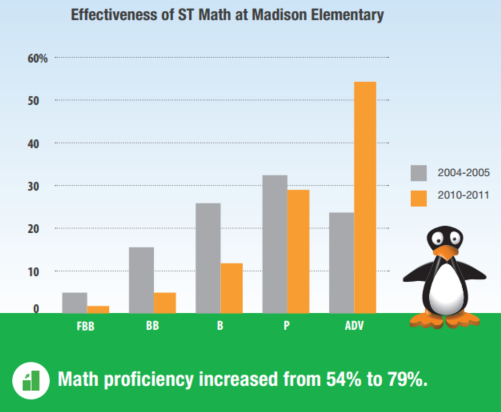 Math proficiency increased from 54% to 79% at Madision Elementary. 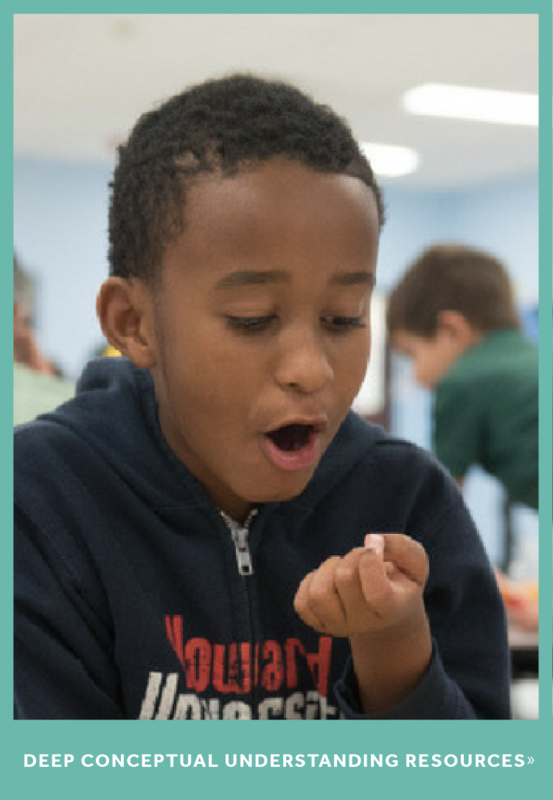 ST Math’s impact can be seen both schoolwide and in individual students. Some students who had difficulty in reading, and really in all subject areas, began using ST Math and quickly moved through the program. We were able to identify students’ incredible mathematical ability that we did not see with the use of traditional instructional methods like textbooks. I always remember the student with autism who in a single year moved through two grade levels on ST Math. This opened our eyes to his true mathematical ability, and we began mainstreaming him into regular education classes with support. Overall, ST Math has helped us to motivate students and build their self-confidence. Students are excited about learning new math concepts, and often we see students make connections in the classroom to the interactive games played in ST Math. For example, our third graders often have difficulty learning place value. As a school, we decided to have students play one of the ST Math games prior to learning the concept. 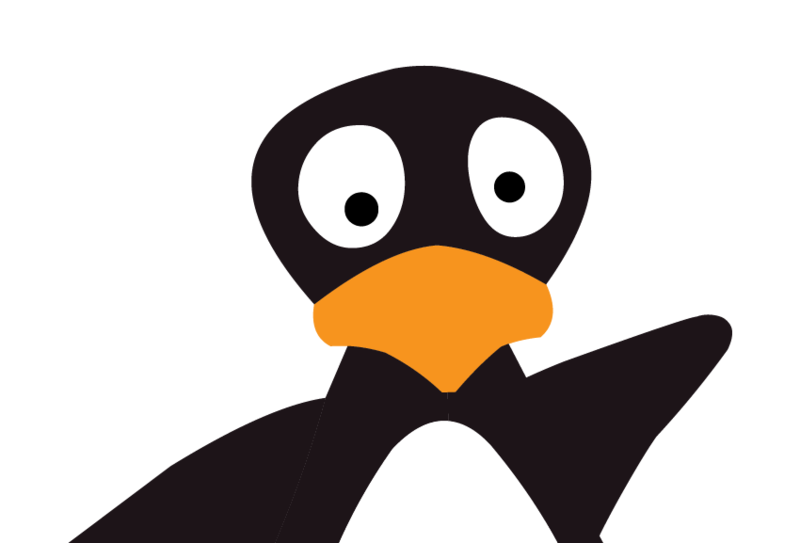 Then when teachers introduced the concept, a student would shout out, “That is just like the JiJi game!” (JiJi is the penguin character in all of the ST Math games.) Students could visualize concepts by making connections between the games and the lessons in class. After that, our teachers starting using ST Math to help introduce other topics and bring the math concepts to life. Using ST Math also changed our school culture about technology. When I arrived at Martin Elementary, teachers were so wary of implementing technology that they were actually rolling computers on carts out of their classrooms. 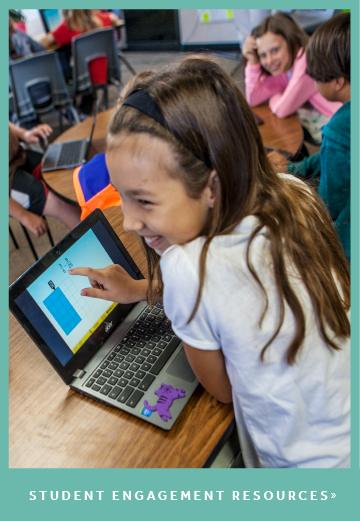 After implementing ST Math, teachers were asking for those computers back, and requesting more computers be purchased so they could integrate the program into their classroom math instruction. ST Math has also helped students access and become proficient with technology. I have seen ST Math transform mathematics instruction and technology use in all of the schools I have worked at. While ST Math software games use interactive, graphically-rich animations that visually represent mathematical concepts to improve conceptual understanding and problem-solving skills and incorporates the latest research in learning and the brain and promotes mastery-based learning and mathematical understanding, it is so much more. It makes learning fun and helps us to identify students’ strengths and build their confidence. ST Math enables teachers to reach all students at their level, helps students to access technology, and provides students with opportunities to be successful learners. It has helped us foster a love of mathematics and a love of learning in our students.